Say goodbye to your ultimate career goals and say hello to a lifetime of having that feeling of guilt that comes with watching videos of cats when you should be studying! I went on a holiday to this wonderful place during exams this semester and oh what a fun time I had! There’s always a myriad of things to do at this Procrasti Nation. All your favourite things to do when avoiding important tasks are there like video games, movies, Ebay for when you get the urge to window shop, books, a messy room to clean, origami to fold, Wikipedia for when you want to learn about confusing roundabouts in England and the list goes on! 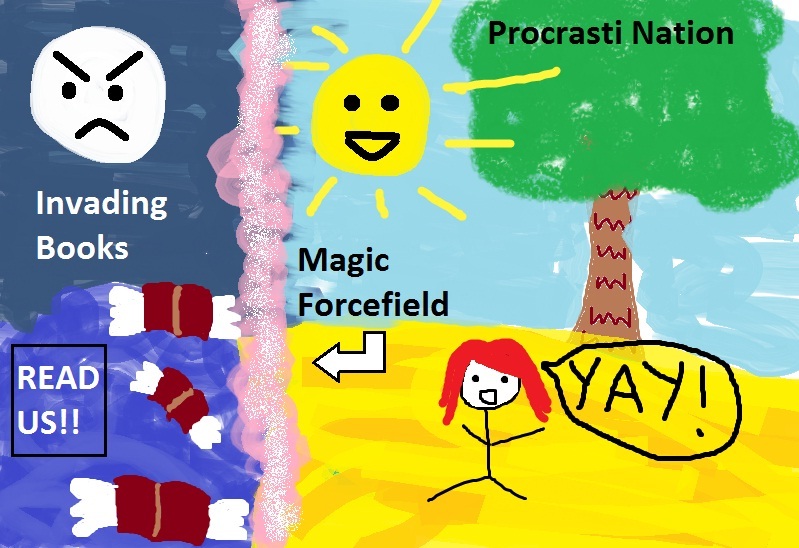 As you can see from the diagram above, once you’re safely on the warm shores of Procrasti Nation, a pretend-it-doesn’t-exist forcefield is activated to keep you safe from those nasty books and lecture slides trying to ruin your fun times. You can stay for as long as you like, but side effects from over exposure to Procrasti Nation include stress-induced hysteria, guilt, anger and general despair. On a more serious note, I procrastinated as if there was no tomorrow during final exams this semester. I wasn’t in the mood to memorise the various modes of entry companies can use to enter the global marketplace, it just didn’t interest me. And for some reason I wasn’t stressing or worried about the fact that I wasn’t studying. I just didn’t care, which is very unlike me because in Year 12 I’d be buckling down with my notes and cramming like a mad woman. And that’s the bit that scares me, I didn’t care. What’s happened to me! Was there a lazy uni student button that was switched on in my brain? Before too long it was 2 days before my exam and the guilt had finally taken over. The forcefield had failed me and now all the info and books assaulted my brain and I’m thinking “Oh poo, the exam is in 2 days, TIME TO CRAM!” And cram I did. Considering that I’d left a whole semester’s work to memorise till the last minute, I still managed to get decent grades. I wasn’t expecting anything magnificent but when I realised I was 2% away from getting a 7 in Marketing, it made me stop and think what I could have done if I’d started studying earlier. I think need to work on my self discipline if I want to get anything done and start getting grades I’m proud of. Getting a 7 after a lot of hardwork would be more rewarding to me, it will feel like all that effort paid off. I will make it my goal to get at least one 7 next semester. So, this calls for a mid-year resolution! I end up saying this to myself after exams each and every year, but this semester will be different! I WILL take notes that I can actually read on my lecture slides. I WILL organise my notes in an easy-to-find manner and read them over every week to ensure the info is stuck in my brain. I WILL leave enough time to study before my final exams. For all you fellow procrastinators out there, feel free to follow along with these goals too, maybe we all need some motivation to keep us on track. I hope I can stick to this, fingers crossed. What are your procrastination habits? Do you have any advice for chronic time wasters such as myself? 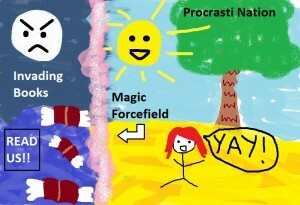 Procrasti Nation is my home away from home. I visit it right up till the last day before an exam. Luckily though I’m getting better but I have started to fall into the state of “how many marks do I need on this exam to pass?”. Note to all, this is a trap. It’ll lure you into a false sense of security. Do not fall victim to it’s alluring ways. You’ll only come out worse.